Jens Grunwald, Assistant to the Board of Directors of HARTING Germany explains how the company’s products are helping develop the wind energy market. Some parts of the German energy industry in conjunction with wind turbine manufacturers are the force behind the energy revolution that started in the 1980s with the promotion of renewable energy and the move away from building new nuclear power plants. This energy revolution gained even more momentum when the law phasing out nuclear energy was passed in 2011. Germany leads the world in the use of alternative energy through the promotion and construction of wind turbines. Over 27,000 of them were introduced there by the end of 2016, delivering around 46,000 MW of installed output. Most turbines are operated onshore. 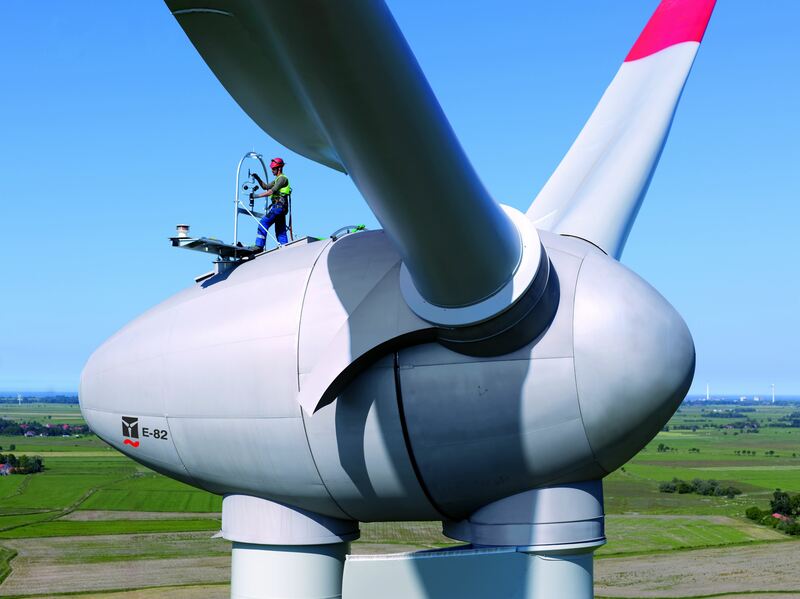 The demands on all components of onshore turbines are extremely high. A wide range of different components and subsystems are incorporated within the turbine for power supply, data communication and transmission of control signals. Powerful connectors have an important part to play in this respect, helping to control the gondola, the position related to the wind, changes to the rotor blades, blade heating and beacons, for example. With its products and innovative technical expertise, the HARTING Technology Group has acted as technology partner to the world’s major wind turbine manufacturers for over 30 years – giving it a huge amount of experience in the wind energy industry. Premium quality, first class workmanship, tailor-made designs and maximum durability are essential. The same criteria apply just as much to small wind turbines in hilly low wind locations with a rated output of around 45 kW and a rotor diameter of just a few metres as it does to large wind turbines with a hub height of 140m and a rated output of 4,000 kW. HARTING therefore offers the Han-Eco module – a connector that has a high protection class (IP 65), is designed for a temperature range of -40°C to 125°C and is flexible in terms of installation. It is made of high-performance plastic, providing a high level of resistance to aggressive environmental factors such as salt spray and extreme mechanical robustness. The Han-Eco is light – satisfying onshore and offshore trends for reducing turbine weight, modular wind turbine design and increased performance due to the increasing turbine heights and larger rotor blades. HARTING is working with the wind energy industry to develop specific and tailored services – from individual components and complete cable assemblies to systems that can be installed during the manufacturing process or on location. HARTING has worked with wind turbine manufacturer ENERCON to build a connector with a black powder coating that is installed in turbines located offshore. Successful joint projects also include connectors for higher current (>100A….300A) and a housing concept for a new LED lighting system inside wind turbine towers. The lighting system uses a long-life (> 100,000 hours), LED bulb developed by HARTING. Cooling elements are set into the housing. The lamps are supplied by two electric circuits (odd- and even-numbered bulbs). There is a signal transmitter at the end of one of the lines, which sounds an alert in the tower if a failure occurs. This mechanism and the division of the electric circuit ensure that the emergency lighting continues to work if an electric circuit fails. The LED lighting for the turbine tower is modular and has an uninterrupted power supply from the base of the tower. This system speeds up installation and makes servicing and maintenance easier. HARTING also supplies LED lighting systems as integral system solutions with pluggable device connection, cable assembly, distribution units and – if required – an uninterrupted power supply. Individual analysis determines the position of LED bulbs on the turbine to keep them to a minimum and reduce energy costs. HARTING is using MICA to forge new paths in the wind energy industry and re-think connectivity. MICA makes it possible to connect existing turbines quickly and cost effectively, adapting them for condition monitoring and predictive maintenance. Digital retrofitting is currently a major topic. But MICA is also ideal for new turbines with de-centralised data capture and processing (“fog” or “edge computing”). Contactless condition monitoring of the temperature on the rotating axles is just one example. Temperature is recorded over the lifetime of the axle via RFID without the need for batteries and processed on the MICA. An alarm is only triggered if a threshold is exceeded. This “little” Hermes award winner shows us what we are now able to do.